Ten-nearly-eleven-year-old Isaac and his mother live in and manage a caravan park on the Queensland coast. It’s summer holidays, the busiest time of year for a caravan park, and Isaac and him mum are both flat out keeping the park running smoothly and the guests happy. It’s also the time of year that turtles return to the place of their birth to lay their own eggs. Isaac is keen to help the rangers protect the nests, but that’s harder than it feels like it should be. Guests with out-of-control dogs, others with fancy cats and still others who just don’t seem to understand the consequences of their thoughtlessness. Add to that a grumpy blogger who has the potential to cost his mum her job, a cheesed-off friend and no time for himself and Isaac has good reason to feel overwhelmed. Lucky he’s so determined. Life has been rough for Isaac and his mother as they adjust to life without Dad. Isaac is doing his best to help out, but she’s so busy that his efforts are not always noticed or appreciated. He would like to spend time with his friends, at the beach, but most of all he wants to help the rangers protect turtles and the eggs they lay on the beaches all along this coast. 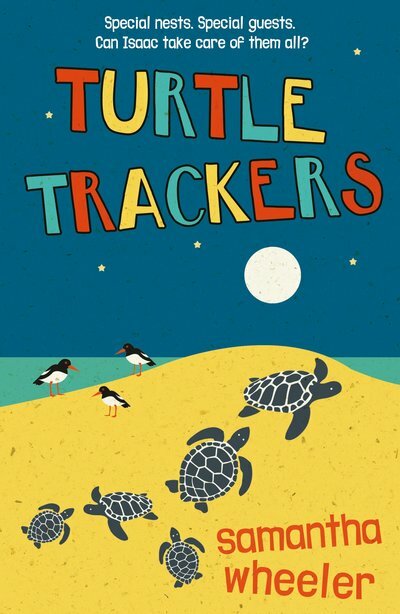 ‘Turtle Trackers’ offers readers an opportunity to join an adventure by the sea and to learn about turtles and the people who help keep them safe. Themes include communication, family, friendships and care for the environment. Recommended for mid-primary readers. Other titles from Samantha Wheeler include ‘Mister Cassowary’ and ‘Wombat Warriors’, both with environmental themes.